Econet founder and executive chairman Strive Masiyiwa has said he believes President Emmerson Mnangagwa is sincere in what he is trying to do to turn Zimbabwe's crippled economy around. Speaking in an interview with CNBCAfrica, Masiyiwa said he has invested some $1.5 billion in Zimbabwe over the past decade and would always invest in the country "come rain or sunshine". The intervention by Masiyiwa - an internationally respected businessman entrepreneur, and philanthropist - is certain to be welcomed by President Mnangagwa and his under-fire administration. Having moving to charm the world with reform pledges after taking over power through a military coup last November, Mnangagwa's momentum was rocked by a disputed victory in the July 30 vote and post-election violence which left six people dead. Fiscal and monetary policy interventions after the vote have also plunged an already struggling economy into further crisis with shortages of basic commodities becoming common and prices spiralling. 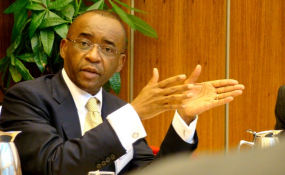 Masiyiwa - now based in the United Kingdom - has not returned to Zimbabwe since the year 2000 when he left the country and settled in South Africa from where he developed Econet into a global telecoms and fintech behemoth. In the CNBCAfrica interview, the Econet founder backed calls for the removal of sanctions against Zimbabwe, saying the country should not have to operate with "its hands tied behind its back". Masiyiwa appears to have taken a shine to the Mnangagwa administration after being blocked from launching his business and then hounded into exile by the former Mugabe regime. At the height of the cholera crisis, the Zanu PF leader revealed that the Econet founder had phoned him from Ethiopia and donated US$10m to help address the epidemic which claimed more than 50 lives across the country. However, not everyone is impressed by his apparent confidence in the Mnangagwa government. Opposition politician and former education minister David Coltart challenged the telecoms tycoon to put his feet where his mouth is.